Your kids will love this Freezie crocheted pop holder. Make it in colorful and distinct versions to amp up the fun. While this crocheted pop holder can be made in different variants, making this is really easy and can be done by a beginner crocheter. The given steps in the FREE crochet pattern are to make this pop holder in one size. However, the designer added steps to make the pop holder in five really fun variants. The versions in the FREE pattern are an owl, ninja turtle, minion, light saber and Poké ball. 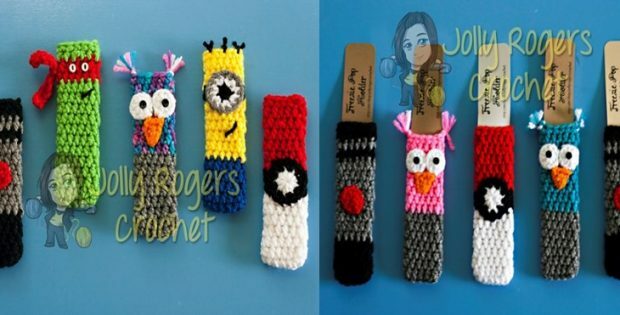 Elizabeth Rogers for Jolly Rogers Crochet created these entertaining versions of a pop holder. Download the FREE pattern for this lovely crocheted crocheted pop holder in different variations. To download the FREE crocheted pattern for this fun Freezie crocheted pop holder, please click here: Freezie Pop Holder Variations Pattern. Featured image(s): Elizabeth Rogers – thank you! It says the page is unavailable. Paula – I apologize the link isn’t working properly. But I’m pleased to inform you that we have fixed the problem.